Whereas the 427 was unable to service the EMS (Emergency Medical Services) market, Bell was right on track with the development of the 429. This machine is also a light-weight, twin-turbine helicopter with a four-blade rotor head. Bell developed this aircraft in close cooperation with Korea Aerospace Industries. In terms of the 429, this program has led to an all-new modular airframe concept and the use of new composite rotor blades. Bell also stretched the fuselage to create enough space for a stretcher to fit in well. The machine's basic configuration uses a full glass cockpit supporting single pilot IFR capability. The tail rotor configuration follows the form of an X, which helps to lower the machine's noise footprint. The 429 is equipped with the same turbo shaft engines as the 427. During its test program, Bell used a modified 427 as a MAPL technology testbed. The 429 was certified in 2009. Rotorhead 4 blades, elastomeric bearings. Your collection of Helicopters and their specs is awesome. My final destination bfir any info about Helicopters is your site for no doubt. Number of Tail rotor blades on Bell 429 are 2 ? I could see this Helicopter consists of Four blades in X arrangement. Probably you mean 2 pairs ? I changed the number of tail rotor blades to 4. 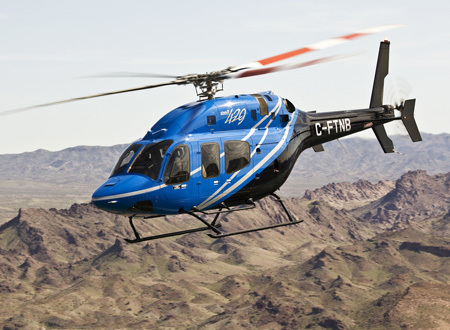 Do you want to comment the Bell 429 GlobalRanger helicopter?